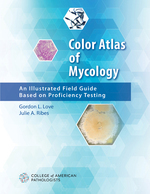 Color Atlas of Mycology: An Illustrated Field Guide Based on Proficiency Testing is an up-to-date resource designed to assist pathologists and medical technologists in the laboratory identification of fungi using the most recent taxonomic classifications. The text includes more than 15 years of proficiency testing data to highlight diagnostic clusters of incorrect identifications and address conceptual classification issues. Building on the popular Mycology Benchtop Reference Guide, it is more comprehensive and complete, merging in vitro mycology (colonies on plated media/LPAB preparations) with in vivo mycology (histology/cytology). Contents include yeast and yeast-like fungi, hyaline molds, dermatophytes, dimorphic fungi, mucormycetes, and dematiaceous fungi. Also included are collection, transport, and culturing of clinical specimens for fungi; identification methods; colonial and microscopic morphology, taxonomy, and disease characteristics; essential facts, including potential look-alikes, key differentiating features, ecology, and MALDI-TOF; and in-depth “A Closer Look At…” discussions on subjects such as germ tube testing and patterns of infection.